Every day, people, from around the world, travel across the globe, with the usage of airplanes as their transportation to get from point “A” to point “B”. Regardless if it’s for business or pleasure, commercial or private, or economy or business class, millions take to the skies each day, utilizing the high speed advantages of flight to travel great distances in a reasonable amount of time. While the standards and practices of safety are high palpable and are maintaining on most commercial and private airlines, the event of something “disastrous” can still occur during flight, with numerous “worst case scenarios” that can be played out. Some could be a minor fluke with minimal damage or loss of life to either the plane or its passenger, while others have been fatal and catastrophic (its the risk that we all take when flying). And then there are moments that, in the face of disaster, a “miracle” can happen. Such is the case on January 15th, 2009 when the events of “Miracle on the Hudson” took place, sparking instant media coverage on the crash of US Airways Flight 1549 all the heroic efforts of New York’s citizens (those who partake in the rescue) as well as the plane’s crew, especially its pilot, Captain Chesley “Sully” Sullenberger. Hailed as hero, the story of Sullenberger was capitalized in the mainstream media, prompting the prime focus on himself on his decision that saved his passengers and crew. Now, after seven years since the “Miracle on the Hudson”, Warner Bros. Pictures and director Clint Eastwood adapt Sullenberger’s memoir “Highest Duty: My Search for What Really Matters” with the film Sully. Does this film adaptation fly high or does cruise in low-altitude? Preparing for a normal flight from New York City to Charlotte, North Carolina, Captain Chesley “Sully” Sullenberger (Tom Hanks) was going through the “standard” flight procedures, with his co-pilot Jeff Skiles (Aaron Eckhart), and ready to launch 155 passengers and three flight attendants into the cold January sky. Soon after takeoff, a flock of passing birds take out the engines of US Airways Flight 1549, forcing Sully to hastily make a series of decisions to save the plane and the people on-board. 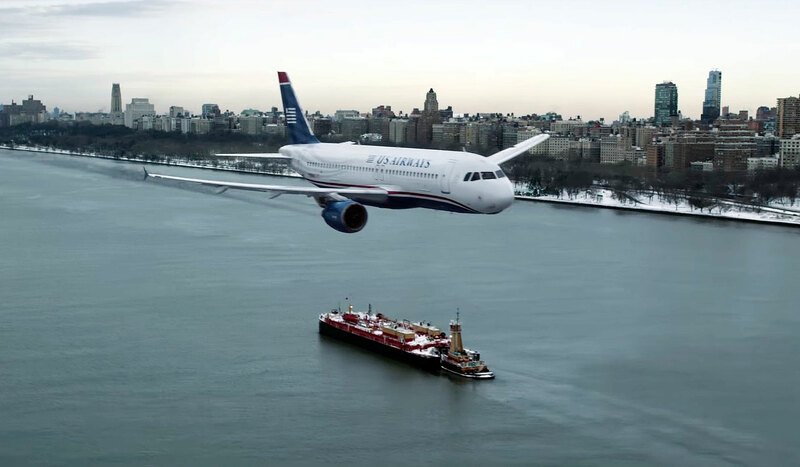 While air traffic controllers prompt and prepare a return to the airport (LaGuardia Airport), Sully realizes he can’t make it the journey back (nor to nearby Teterboro Airport), landing the aircraft on the Hudson river. The aftermath of the event causes a barrage of media coverage and recognition, with some calling Sully a hero for his quick-thinking action in saving everyone on Flight 1549. However, members of the National Transportation Safety Board (NTSB) aren’t convinced, question over evidences and statistics in an effort to discredit Sully’s decision, while Sully, who can’t completely “snap out” of the ordeal and haunted by a “what if” scenario, with wife Lorraine (Laura Linney) trying to make sense of what is going on within her husband’s mind. What can I say…. I love to travel. So, of course, I’ve flown in airplanes many times, some short distances (Baltimore, MD to New York City, NY) to some more that were much longer in duration (Los Angeles, CA to Sydney, Australia. Luckily (knock on wood), I haven’t experienced a disaster during the brief tenures of flying in planes. And yet, that “worried” feeling of something potential bad going wrong (whether plane crash or terrorist threat) always lingers in the back of my mind while I’m on a plane (sad, but true). Anyway…. I remember watching the events of the “Miracle on the Hudson” unfold (I was home at the time of the crash) and was bit astounded by the crash itself and the daring rescue of everyone on Flight 1549. After the initial media coverage praise of Sullenberger and of Flight 1549, I stopped watching / listening to the “Miracle on the Hudson” media outlets, which brings to the events of the new movie Sully. I was interested to see where the movie would go and, by watching several of the film’s movie trailers, was curious about the controversy surrounding Sully’s decision, reigniting my interest into the whole “Miracle on the Hudson” episode. After viewing the movie (I actually viewed the same day I flew on an airplane), I believe that Sully, while not absolutely perfect, is a highly respectable drama feature, thanks to its director, lead actor, and its real life narrative. The directorial mind behind Sully belongs to someone who needs no introduction. Legendary film director Clint Eastwood, the mind behind such films as Million Dollar Baby, Gran Torino, Flags of Our Fathers, and American Sniper takes an interesting “real life” event and prepares it to undergo a cinematic adaptation. Thankfully, Eastwood is respectful of its source material and crafts Sully in a way that’s riveting and also entertaining at the same time. To me, Eastwood gives Sully an interesting platform on human behavior as we (as humans) sometimes look for an “ulterior motive” behind a person’s action, regardless if their intentions are purely genuine or not. It’s nothing new per-say (it was done earlier this year in Batman v Superman: Dawn of Justice), but the story of Sullenberger and whole “Miracle on the Hudson” gives it a more interesting “human” quality (a man faced with sudden and possible fatal decision). It’s like the old saying “some are born with greatness and some have greatness thrust upon them”, which, in Sullenberger’s case, it’s the latter rather than the former. Of course, the main “draw” for the movie is in the actually “Miracle on the Hudson” crash / event, which is handled quite well. With the film set after the event, this scene is presented via flashback (returning several times to “fully” capture on what happened and what was said between Sully and Skiles). The crash itself is handled well and not “blown out of proportion” in a blockbuster style-crash. Eastwood also (briefly) showcases several of the passengers (before, during, and after) the whole crashing onto the Hudson river. These characters help build the tension during the actually crash scene and displaying the “human” factor of drama / emotion that’s require for the movie. I think it’s kind of funny that some of these characters are presented as the “stereotypical” people who travel on planes (i.e. the people who almost don’t make the flight, the single parent that has a child, the individuals who wants to buy some form of knickknacks at the “Duty Free’ shop, etc.). Its effective as we all know these types of people (or might be one) and works for what the movie wants to project (the regular average passenger that’s about to face a terrible ordeal). Also, in terms of filmmaking, Eastwood and his crew do a good job from top to bottom (costumes, camera angles, cinematography, etc.). Interestingly, beyond the initial “crash event” and NTSB investigation, Eastwood presents the film with the “inner turmoil” of Sullenberger, painting the feature with his own self-doubts. In truth, Sully is an ordinary man (a person who’s just doing his job) who faced quite an extraordinary circumstance and, with his seasoned pilot instinct, miraculously saved all 155 people aboard. While, this is all good (some calling him a hero for his harrowing decision), Sully himself doesn’t feel like one and, once NTSB begin to question the outcome, he too begins to question himself. He’s then haunted by his decision, struggling with form of PTSD, as several “what if” scenario are presented with plane crashes in the heavy populated areas of New York City. Its compelling work from both as film and for a story (as I’m sure the real Sullenberger was faced with a similar inner turmoil and post-self-doubt) and certainly does paint a very real picture in today’s world. In truth, Sully is a double-edge sword of a feature that both strengths and weakens its likeability (depending on the viewer’s perception). What I mean is this…. the movie only has a runtime of 95 minutes (the somewhat standard runtime for an animated film), which can be both good and bad. For the good part, Eastwood makes the movie clear and precise on what it wants to discuss and present to its viewers (i.e. cutting right to the point of the feature) and focusing on the events surrounding the “Miracle on the Hudson” without adding that much of superfluous “filler” scenes or any frivolous side-story plots). On the other hand, due to this direction, Sully (as a film) is squarely focused on the “Miracle on the Hudson” event and nothing else. Because of this, those expecting to see “the life and times” of Chesley Sullenberger are going to be disappointed. Yes, there are a couple of flashbacks scenes, including the main one of the actual crash (several times via different, but not enough for a complete “full-circle” life story of Sullenberger. Also, I do have to point out that Eastwood makes the members of the NTSB out to be the antagionists (i.e the “bad guys”) in the movie, questioning Sully’s motives and decision making for crashing US Airways 1549 into the Hudson river. Given how the film’s story is structured, I kind of figured that they would do this, but it seems a bit forced (at some points). Like Eastwood, actor Tom Hanks has had an illustrious career in Hollywood, building a reputation for his acting talents in such films like Forest Gump, The Da Vinci Code, Saving Private Ryan, Captain Phillips, and many others. Also, much like Eastwood, Hanks has had a few “mediocre” projects that have been regarded as “throwaway” roles or unmemorable feature films. Still, Hanks has proven to be a great lead actor, revered for his talents of jumping into a character’s persona and completely “owning” the role. In Sully, Hanks does it again as the film’s main protagonist. The role of Sullenberger doesn’t demand a “theatrically bold” performance, but rather a role that’s both commanding and fragile at the same time, which, of course, Hanks pulls off masterfully, with subtle facial expressions and the inner turmoil are clearly visible in his performance. I’m hoping that he gets a nominated for his performance at this year’s award season. 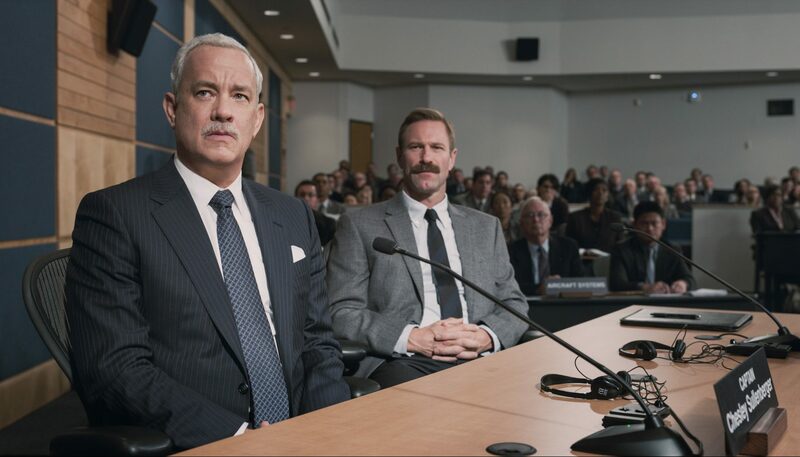 In supporting roles (behind Hanks) is actor Aaron Eckhart who plays Sully’s co-pilot Jeff Skiles. Eckhart, like Hanks, does the job great, easily slipping to the role and doesn’t underperform nor overacts the character. It has also helps that both Eckhart and Hanks share a charismatic duo as their scenes together are great and well-handled. Personally, while I do like Eckhart as an actor and does fine job as Skiles, it’s still a bit hard (to me at least) see him as anything else than Harvey Dent from Christopher Nolan’s film The Dark Knight. The other supporting role character in the movie that’s worth mentioning is actress Laura Linney, who plays Sully’s wife Lorraine. While Linney’s acting is solid (I love her in the HBO’s miniseries John Adams), her character (the worried and concerned wife) seems a bit manufactured (almost shoehorned) into the movie to drum up relationship drama. Her phones with Sully are understandable and sound (I’m sure the two talked over many phone call conversation during the real life event), but, in the movie, it becomes tad bit repetitive. The rest of the supporting players in Sully range from minor supporting roles to cameo-like appearances that drop in and out of the feature, which is not a bad thing as many recognizable from other projects. This includes the three main principal NTSB members (Anna Gunn as Elizabeth Davis, Mike O’Malley as Charles Porter, and Jamey Sheridan as Ben Edwards), Holt McCallany as Mike Cleary, Michael Rapaport as Pete (the bartender), Sam Huntington as Jeff Koldjay, Max Adler as Jimmy Stefanik, and Jerry Ferrara as Michael Delaney. Lastly, Sully has real life people portraying themselves in the features, which includes ferryboat Captain Vincent Peter Lombardi and new reporter journalist Katie Couric. Our whole lives can be boiled down to a single moment decision, a moment that can glorify an individual or tear him apart (whether by outside forces or inner struggles). Such is the case in the new film Sully. Director Clint Eastwood’s latest film repositions the “Miracle on the Hudson” underneath a cinematic lens that’s elevated by direction, fantastic lead in Tom Hanks, and its “true life” narrative story. Personally, I like the movie. It was structurally different, which I liked, respectful of its source material, and Tom Hanks was great portraying Sully as well as the rest of the cast. Thus, I would “highly recommend” this film to everyone, it’s a safe bet of a movie that probably won’t offend anyone. The feature isn’t perfect, a bit rough around the edges, but Sully is still a compelling and an interesting piece of work, which may prompt viewers to revisit the real life account of Chesley “Sully” Sullenberger and the tragic miracle of Flight 1549 (It did for me). Nice review! I’ve heard good things about this one, but it looks pretty similar to Flight, in subject matter, do you reckon it’s as similar as it looks?